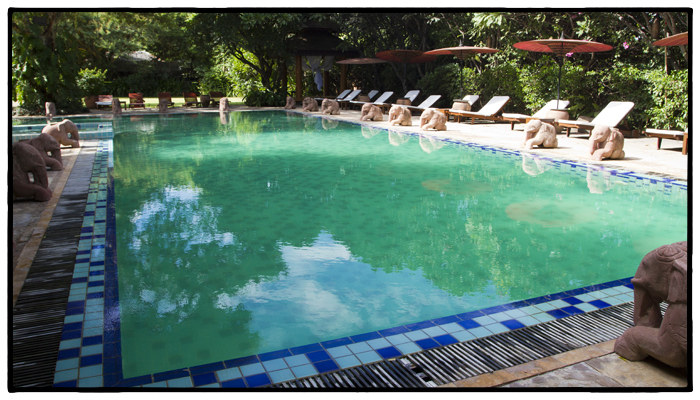 Should you stay at the Aureum Palace Hotel in Bagan? 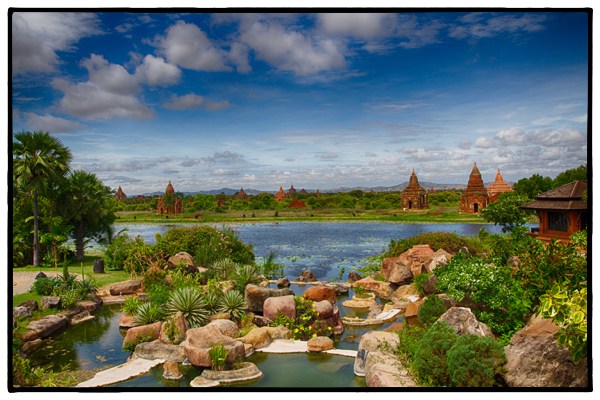 A view from the pool at the Aureum Palace Hotel in Bagan looking across the pond to the temples. Photo by David Lansing. They say the best hotel in Bagan is the Aureum Palace so yesterday afternoon I stopped by to have a look. 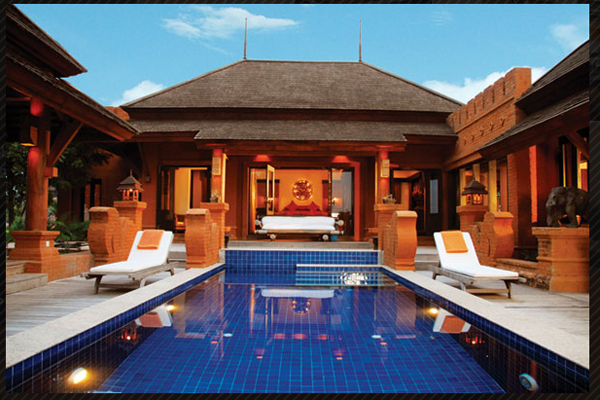 The resort sprawls across 27 acres and includes a sushi bar, spa, and 72 villas, including the thousand-dollar-a-night Island Villa with its own lap pool, sun deck, and a personal valet. The Island Villa was vacant (but very beautiful) as were most of the other villas and guest rooms. In fact, on an hour-long tour of the property I think I only saw two or three guests, and they were sitting in the lobby drinking tea. No one at the pool. No one at the spa. No one walking around the extravagant five-star property. So what gives? Does that explain why there are few guests? Perhaps. Or perhaps it’s because of the weather. 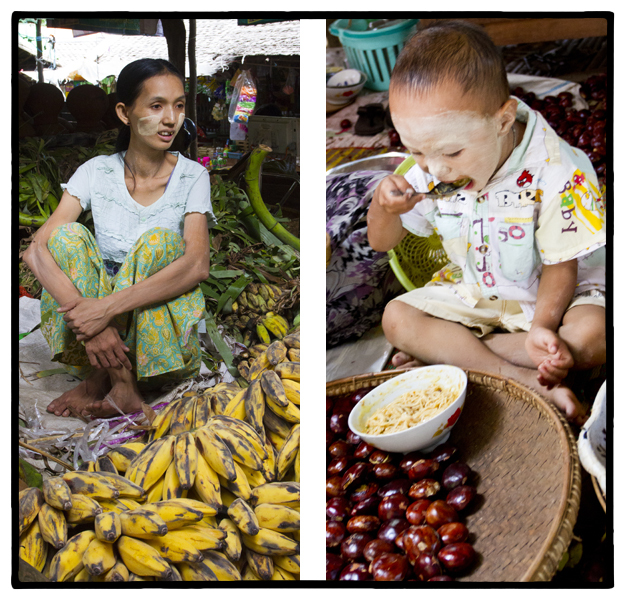 We are coming to the end of the intense monsoons here in Burma when daily temps in Bagan often eclipse 100°F. So maybe it has nothing to do with tourist’s feelings about Tay Za at all. Then again, our hotel, Tharabar Gate, seems to be completely full. For $1,000 a night you can rent the Island Villa at the Aureum Palace Hotel which comes with its own lap pool and valet–if you don’t mind the company you keep. Elephants line the pool at the Tharabar Gate Hotel in Bagan, Myanmar. Photo by David Lansing. There may be over 2,200 temples, pagodas, and monasteries on the dusty red plains of Bagan but all I wanted to do today was sleep on a lounge shaded by a red umbrella beside the jade green pool lined with little clay elephants at the Tharabar Gate Hotel. “I cannot look at temples this afternoon,” I confessed to my young guide, Sai, when he suggested an afternoon visit to the Shwezigon Pagoda. And so, with more than a little bit of guilt, I took the afternoon off. I walked from one end of the pale green pool to the other. I ordered a tropical cocktail. And I fell asleep on my lounge chair while reading Paul Theroux’s The Great Railway Bazaar once again. It was the perfect afternoon. So how do you know when you’re no longer in Thailand? When the concierge at your hotel in Burma looks like this. Tharabar Gate Hotel, Bagan. Photo by David Lansing. 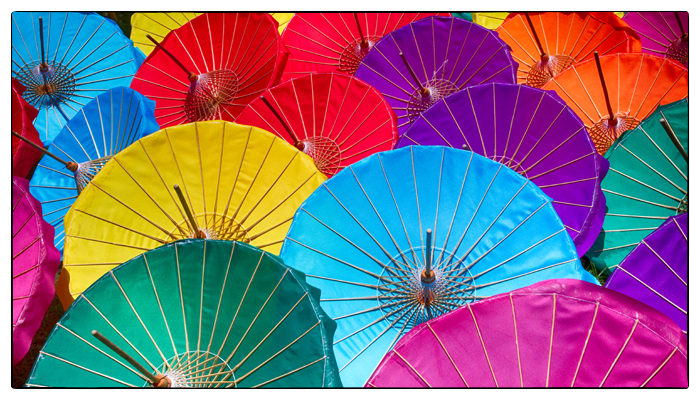 Just-dyed umbrellas drying in the sun at the Bo Sang umbrella village. Photos by David Lansing. I’m starting to be suspicious of Ketsara’s motives. She never suggests we go look at a temple or feed the monks just for the hell of it. There’s always some deeper reason. And most of those reasons seem to have something to do with my edification. 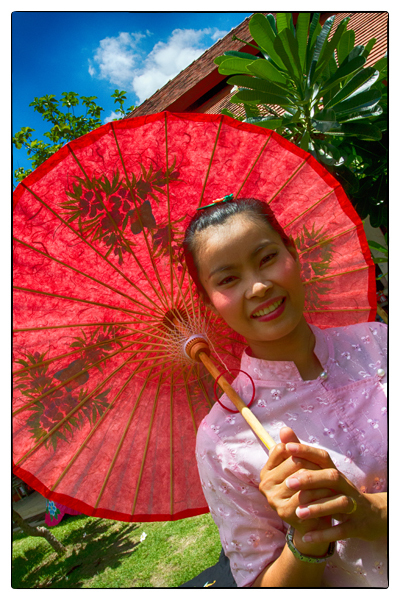 So I was pleasantly surprised when yesterday afternoon she suggested we go to the umbrella factory in nearby Bo Sang. What could be more benign than an umbrella factory? What do you think of when someone says “umbrella factory?” Probably not much, right? I mean, is there a clear image in your head of what, exactly, an umbrella factory would look like? There wasn’t in mine. I thought, well, it’s probably some sort of warehouse-like building where one person connects the ribs to a pole and another person screws on the handle and someone else attaches the shade. Or something like that. An artist painting scenes on a silk fan. Photo by David Lansing. That’s not what this was at all. This was a place where everything about the umbrella is handmade, from the wood spokes to the color on the paper or silk umbrellas. Imagine a horseshoe-shaped pavilion with a grassy central area in the middle and dozens of workers—mostly women—sitting casually on the floor doing whatever it is each one of them is supposed to do. 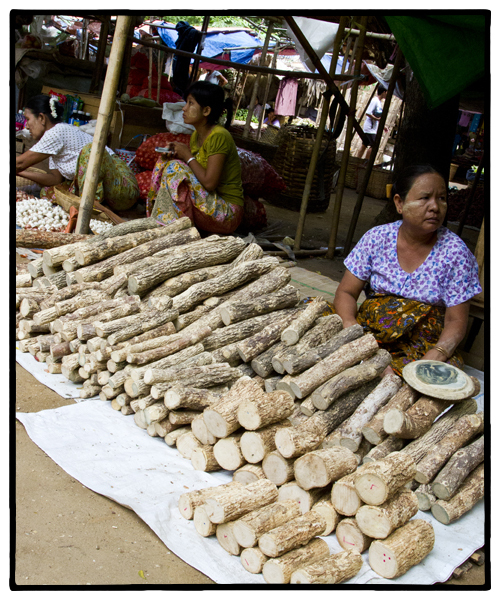 Some of the women do nothing but use a small hatchet to split strips of wood from a two-foot round limb. Some other women do nothing but shave those strips in to squares. And another group of women sands the strips. I mean, talk about labor intensive! And this is the way they’ve making making umbrellas in this village for two-hundred years. The most interesting part of the process to me, however, were the artists who hand-painted the umbrellas. Some of the scenes were really elaborate—like a forest with tigers—and some of it was just symbols or lettering, but it was all beautifully done. As I was watching this, Ketsara went over to an artist who was decorating a hand fan, which they also make here, and talked to her. The artist nodded and picked up a just-made deep blue silk hand fan and painted something on it in gold Thai lettering. When she was done, she handed it to Ketsara with a bow. She brought the fan over and handed it to me. I took a look at it and handed it back. So here we are again. Even at the umbrella factory Ketsara can’t help but send me a message. Even if I don’t know what it is. And maybe that is the message. Umbrella girl has a message for me. But I’m not sure what it is. Photo by David Lansing.